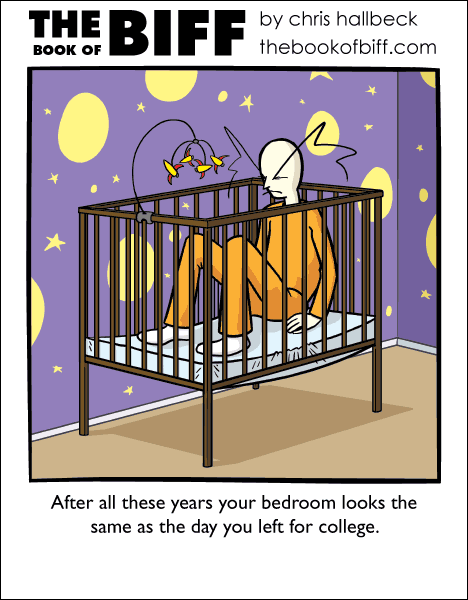 I still have a vivid memory from back when I was in a crib. My mom was downstairs in the kitchen talking to a friend. This was at night and I woke up. I could hear them talking but they couldn’t hear me yelling “Mom!” As I was cry/yelling my mouth formed a spit bubble that covered the entire opening of my mouth. I inflated the bubble with the word “mom” until it popped. Now I had a new game to entertain myself with. I was no longer upset but I continued to bubble yell until I fell back asleep. Today’s Maximumble goes to the show. I see you’d Cage the Biff. I think my earliest memory (though not that vivid) is from when I was almost two years old. The only thing I remember, however, is that I was digging in a flower bed with my blue plastic spade, and I *think* most of the plants in the flower bed were withered and dead. Oh, yeah, and I was wearing a cap with a plastic rim! I guess Biff was a baby Einstein. Guess he slept like a baby. My earliest memory was either getting stung by a wasp in the hand, or a huge thistle plant in the flowerbed that had such pretty purple flowers that I didn’t want mom to kill it so she didn’t. I asked Mom a while ago which was first and she said those two happened around the same time so she didn’t know either. my fondest memory, was walking to my grandmother’s place, and stepping on a thistle plant…then pulling out the thistles by my self…yeah, I am independent!